The HTC Titan is equipped with a 8 MP autofocus camera with a few tricks under its belt - it utilizes a 28mm wide-angle F2.2 lens and a BSI (back-side illuminated) sensor. The end result is stills of 3264x2448 pixels resolution. It also features a 1.3 MP front-facing camera for self-portraits and video calling. What the fancy camera specs actually mean in real life is that due to the wide-angle lens you'll be able to fit more into the picture than with regular 35 mm lens phones. The F2.2 aperture number means that the phone's camera can capture images with more light, which coupled with the BSI sensor produces very well-light images even in darker environments. More on that to follow in the image quality section later on. The camera UI is pretty simple – you have your viewfinder and some controls on the right. From top to bottom they are the still/video camera toggle, second video-call camera toggle, virtual zoom buttons and an extended settings menu. On the left you have an arrow that takes you to the images taken with the camera, alternatively you can do a swipe gesture too. The camera app on Windows Phone offers very extensive settings, ranging from scenes and effects to white balance, contrast, saturation, sharpness, ISO and more. Interestingly the camera key will wake the phone with a single press – that is unlock it and start the camera. Unfortunately it doesn't utilize the proximity sensor like before and now the camera app can be accidentally opened in your pocket. The noise reduction is too aggressive, giving photos that dreaded watercolor painting look. Fine detail is smeared over but even then, there's still some color noise visible. The Titan finds a better balance between the clipping of the highlights and shadows than most but it suffers from the same yellowish oversaturated colors as the XE. There was a noticeable pink spot to most of the samples too. Photos in the dark with the Titan were noisy with decent detail. The flash was strong but but there's a tint affecting the whole photo. Other than that low-light shots are pretty usable. The HTC Titan has a wider angle lens that its competitors, which gives it an edge in landscape shots, at the price of lower fine detail and more lens distortion when you get up close. 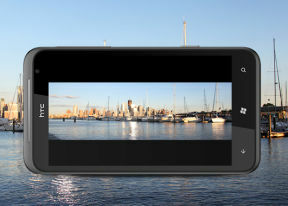 The HTC Titan enters our Photo Compare Tool to join the other 8MP shooters. The tool’s page will give you enough info on how to use it and what to look for. You've already seen the Titan in full detail in our dedicated 8MP shootout review. The video camera interface is identical to the still camera one and has plenty of features too. You can calibrate contrast, saturation and sharpness, change the white balance or exposure compensation and also add image effects. You can use the LED as a video light too. Your captured videos appear in a thumbnail slideshow just as they do in the Pictures hub and Music & videos hub. You get a flash on/off toggle in the settings menu too - the phone uses the LED as a video light. The HTC Titan videos have very good detail for the 720p mark, but again heavy compression kicks in to smudge things out in some areas. Results in the dark are quite alright - noise is kept in check and the amount of captured detail is surprisingly close to that in well-lit videos. The Titan's videos have stereo sound too (AAC codec is used again). Here's a 720 video sample of the HTC Titan. And here goes an untouched 720p@30fps version of the sample for direct download. We entered the HTC Titan in our Video Compare Tool database too and put it head to head with competing mobile camcorders - the Meego-strutting N9 and the Arc S with the Exmor R sensor. This test shows curious results - the camera seems to have potential but the low-bitrate (around 10Mbps) smears out all the fine detail, producing unsatisfactory results. These are same results as the Sensation.